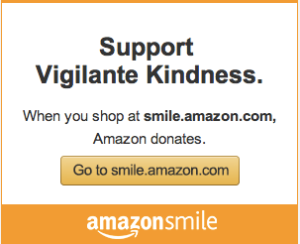 The close of the year is an exciting time at Vigilante Kindness. We’ve wrapped our projects from the previous year and have taken some time to consider, pray about, and begin the baby steps of planning new projects for the coming year. I’m giddy over our projects for 2016!. Some are familiar projects we’re continuing with and others are brand spanking new opportunities. I hope you’ll take a sec to pop over to our Current Projects Page and read all about them, but for now I’ll just say they involve pigs and tractors and feminine products-oh my! In other exciting news, today if you donate to Vigilante Kindness via the PayPal Giving Fund, your donation will go a lot further. Normally VK receives 97% of all PayPal donations, but today we’ll receive 101% of every donation. So if you’d like to make a donation before the calendar year ends, or if you know an organization seeking to make a donation, your donation can do a just little more good today through the PayPal Giving Fund. I’m thankful for how seamless PayPal makes our transactions and thankful that they’re giving back to Vigilante Kindness today. Most of all I’m thankful for you, Vigilantes, for falling in love with the people and places we work with and joining us in committing acts of Vigilante Kindness.